Being locked on a train with not a soul in sight would sound like a good reason to panic, until you hear the soothing music kick in and then all is good. For slow instrumental pieces in an escape game means one thing; TomaTea! They're back with their next escape puzzle game, Orient Express Night:First Station. Yes the grand maker of our favorite escapes such as Early Evening Escape and Salvadoor has given us a new adventure. On this train as you try to find a way out you'll find not much has changed from their other games, but since there wasn't anything really needing to be changed this is good news. There are still plenty of puzzles to figure out and hints to be found. With a mouse that lights up when it's over something you can look at closer or pick up, you won't have to worry about the dreaded pixel hunt. No, things are pretty straight forward on this locked train, and with your skills in seeing hints in the surroundings you'll be finding your way off in no time. Why do we love TomaTea's escape games so much? We may never know, though it might have to do with the clever puzzles, and how the solutions to the puzzles are puzzles themselves as they are hidden throughout the other areas in each game. One of the great things I appreciate about TomaTea's works is that when presented with a puzzle, you're informed if you've actually seen the solution or not. It's a good way to know if you need to keep looking or rack your brain to trying to remember what could have been a hint. However, in Orient Express Night:First Station there are a few puzzles this is glitched on, and it won't speak up if you have no idea what the answer could possibly be, so it's not fully reliable this time around. The ones that did here, from what I found, were early on in the game so it's pretty clear that you don't have the solution yet. Other than that this game plays like a dream. It's a great time to relax and yet get your brain warmed up. So come aboard and start hunting out those solutions so you can find your way off the train and probably into another TomaTea escape game! Orient Express Night:First Station Walkthrough now available! Click on the small table directly in front of you. Pick up the brown square behind the cup of tea. Turn around and head into the hallway. Turn to your right and click on the third window down the hallway. Pick up the brown square on the windowsill. Click on the window shade to pull it down. Note the pattern. Click on the farthest left hand table. Collect the brown square on the chair. Collect the yellow piece on the floor. Click on the bar at the back of the room. Pull the little purple toggle. Note the sequence of flashing lights. Back away and click on the second table on the right. Collect the brown square on the left hand wall. Note the train puzzle on the table which is currently unsolvable. Go back out into the hallway and enter the room at the other end of the hallway. Turn to your left. Pick up the brown square on the wall. Note the cats on the door. Turn left again. Pick up the yellow piece on the windowsill to the left. Head back into the room in which you started. Click on the cupboards to your right. Note the three puzzle locks. Click on the lock for the middle cupboard. Enter the code - you've seen the clue before. Collect the yellow piece. Click on the lock for the right hand cupboard. Enter the code - you've seen the clue before. Collect the yellow piece. The purple toggle behind the bar will reveal a sequence of flashing lights. The code is Left Left Right Right Left Right. Head hack to the dining car. Approach the bar and click in the centre. Use the four yellow pieces that you have collected. Click on the white lightswitch to the left. Rearrange the yellow pieces until you form the correct shape. It will be a key with 'Express' written on it. Take the key. Head back into the hallway. The key you found unlocks the door closest to the dining car. Unlock it and head inside. Click on the cupboards to your left. Once again we have three puzzles to solve. Click on the lock for the leftmost cupboard. Adjust the figure to the correct position. 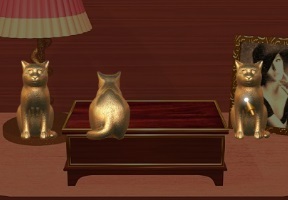 Collect the cat figurine. The clue is in your inventory. Look closer at the brown squares. Click them to turn them over and reveal the clue. Click on the lock for the middle cupboard. Arrange the letters for the correct code. Collect the clock. What are you riding on? Look closer at the clock. Click the clock to turn it over. Collect the winding key. Turn to your right and look at the train sitting on the desk to your right. Put the key in the hole on the train. Nothing happens. Note the panels that open - one on the side and one on the front. Seems like we are missing a cog. Return to the first room. On the table to your left you will find a box with three cats on it. Place the cat in your inventory with the others. Adjust the cats to the correct position. You've seen the clue before. Take the screwdriver. In the front car on the door to the left. Take another look at the back of the clock. Use the screwdriver to undo the back. Take the cog. Return to the second room. Put the cog in the train on the desk. Turn the key and note the pattern on the cogs. Open the front of train and note the pattern - including the headlights. Return to the dining room. Remember the train puzzle on the right hand table? We can solve it now. Note the number shown. On the front of the train. Approach the bar and click on the drawer to the right. Adjust the dials to solve the puzzle. Take the brown square. On the train on the desk - look at the pattern on the cogs. You've now got the clue to open the left hand cupboard. Collect the brown square and the radio dial. Return to the second room. On your right, there is a shelf with a radio on it. Put the dial in the hole. Use the dials to solve the puzzle. Note the colours that appear on the left. You need to line up the coloured ladies with the black ones. Click on the right hand cupboard. You've seen the clue to solve it. Open the cupboard and take the brown square. You should now have 8 brown squares. Go to the front car. Use your brown squares on the puzzle in front of you. Move the squares to solve the puzzle. Take the key. Turn to your left and use the key on the door to escape! There's a few pretty tricky hotspots in this game. Examine all locations closely. Care to enlighten me further? one of the window shades in the hallway can be pulled down, revealing a pattern you can use to solve a puzzle you'll have noticed early in the game. the "light box" puzzle that gives you a key to the room down the hall. I've opened a cabinet in that room to get a clock, and fitted the turnkey into the toy train. I can apparently should know how to solve the "floppy policeman" puzzle, because I don't get a "no clue" message when I click it. I also need a gear for the toy train, and 3 more picture pieces for the puzzle down the hall. So, in other words, Hercule Poirot I ain't. the hard 'hot spot' is really a directional/navigational thing. It's not pixel hunting, but you can turn in a new direction that's located in a somewhat narrow area to find. It's located on the left side of the screen somewhere outside the first room. the picture on the back of the puzzle pieces I had. Once I saw that, everything else was easy peasy. Thanks Corona, I prefer hints anyway! And thanks Bindie for the walkthrough. Does anyone think this might tie into a certain Agatha Christie novel where certain events occur at night aboard a certain train? Orient Express: First Station Does this mean there will be other stations? I hope so! Nice game. ....the train was a ghost the whole time! can't seem to solve the radio. anyone know what i'm doing wrong? never mind. I figured it out. I like tomatea games. Regarding the early puzzles that don't tell you you have no clue how to solve that - S.O.P for TomaTea is that the "I have no clue" message won't be triggered if you don't need to solve another puzzle to find the clue, regardless of whether you've actually seen the clue or not. Usually this means the clue is in plain sight; in this case, it doesn't. This is actually TomaTea's second trip on the Orient Express, so more seem likely.